My mother passed away early this year and I am taking time to put labels on all the quilts quilted by both my mother and my husband's mother. My dear mother-in-law gave me this quilt in the 1980's (she passed away in 1991) and it is made from feed sacks/old clothes/men's shirts. 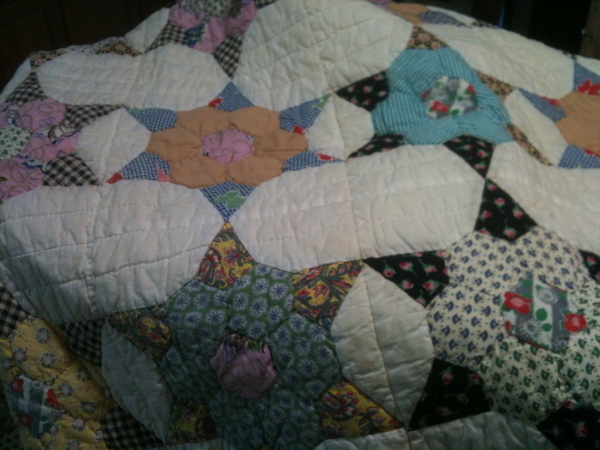 They lived in the mining country of Kentucky until after WWII so I know the quilt was probably made in the 1930's. Could you please look at it and tell me the pattern of the quilt. Much appreciated - I have just finished labeling 6 quilts with about 8 more to go. Born to it, I guess. Looks like some kind of a Grandmother's Flower Garden to me....but I could easily be wrong. ​Looks like a neat way to use a GFG hexagon in the center and piece it into a block format. I don't have a name for the block but you might look for GFG variations. I really like it and may draw it out for my bucket list file.